Is Bolted to a Concrete Pier Placement. The BPH25G is drilled for use with six (6) 1/2 x 12 inch J Bolts or Equivalent Protruding through Pad (Seek Engineering notes in Spec. Sheets, J Bolts Sold Separately), and Allows for the Tower to be Rotated up from Base during Installation. This ROHN Base Plate is 15 inches Square for the ROHN 25G Tower to be Mounted on a new or existing Concrete Pier. 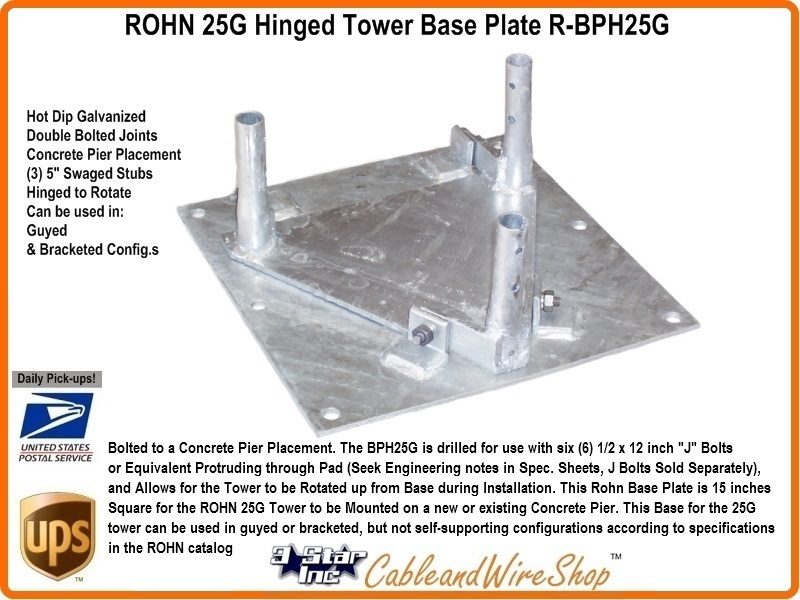 This Base for the 25G tower can be used inguyed or bracketed, but not self-supporting configurations according to specifications in the ROHN catalog. Consult ROHN Catalog Links at Footer Section below for ROHN 25G Tower Details. Note: All 25G Tower Installations should be temporarily Guyed during erection. Not Recommended for Self-Supporting Applications.